As we celebrate Indigenous Peoples' Day, we are launching a series of blogs featuring voices from the field, profiling indigenous participants in the Free, Prior and Informed Consent (FPIC) workshops we held in Colombia, Peru and Ecuador between October 2017 and February 2018 in conjunction with COICA, the Coordinator of Indigenous Organisations of the Amazon Basin. For more information about our FPIC work, click here. All participants consented to their comments and photos being published. The views expressed reflect individual opinions and do not necessarily represent the views of Equitable Origin. Para español, ver más abajo. I am indigenous to the Kichwa people, from Colombia to Putumayo, and I am currently vice-president of the Putumayo Indigenous Organization (OZIP) that covers 11 of the 15 villages in the Putumayo region. To get here [to the workshop] I traveled from Mocoa to the border with Ecuador on the San Miguel River, and then I continued until here, to Lago Agrio. The trip was 6 hours by ground transportation. It is very important for us all this subject of prior consultation, since our territories belong to us and are vulnerable, now they are being subject to oil extraction and at this moment the Putumayo region is practically concessioned to the multinationals, our government is not guaranteeing the fulfillment of our rights. This is why it is important that we, as Indigenous Peoples, know and can use these tools and this fundamental right for us, such as consultation, and in this way be able to defend our territories and guarantee the survival of our peoples, both physically and culturally. 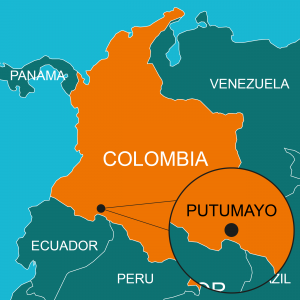 In Putumayo we are currently 15 indigenous groups. Of the 15, 11 are affiliated with OZIP, but for issues like this we are working in unity across the 15 villages. In fact, at this moment we are working on the construction of a protocol for FPIC. 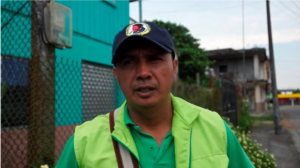 Yo soy indígena del pueblo Kichwa, de Colombia de Putumayo y actualmente soy vice-presidente de la Organización Indígena Putumayo (OZIP) que abarca a 11 de los 15 pueblos que habitan en el Putumayo. Para llegar acá [al taller] viajé desde Mocoa hasta la frontera con Ecuador en el río San Miguel, y luego continué hasta acá, hasta Lago Agrio. El viaje fue de 6 horas en transporte terrestre. Es muy importante para nosotros todo este tema de consulta previa, ya que nuestros territorios nos pertenecen y son vulnerables, ahora están siendo objeto de extracción petrolera y en este momento el Putumayo se encuentra prácticamente concesionado a las multinacionales, nuestro estado Colombiano no es garante en el cumplimiento de nuestros derechos. Por esto es importante que nosotros como pueblos indígenas podamos conocer y podamos utilizar estas herramientas y este derecho fundamental para nosotros, como es la consulta, y de esta manera poder hacer una defensa de nuestros territorios y poder garantizar la sobrevivencia de nuestros pueblos, tanto física como culturalmente. En el Putumayo actualmente somos 15 pueblos indígenas. De los 15, 11 están afiliados con el OZIP, pero para temas como este estamos trabajando unificadamente los 15 pueblos. De hecho en este momento estamos trabajando en la construcción de un protocolo para el tema de CPLI.